A very common question that parents ask is, “What should we use to study for the CLEP or DSST test?” A great way to find resources is to go directly to the source – the CLEP and DSST websites. That is exactly what I did to find the following resource for the DSST Math for the Liberal Arts test. This is a new test that came out January 2017 so there are no “tried and true” resources recommended by others. In fact, I couldn’t find any recommendations which propelled a search of my own. A search of the DSST website led me to their Exam Facts Sheets. One of the resources listed on the DSST Math for the Liberal Arts Exam Sheet is Thinking Mathematically, Sixth Edition. The sixth edition (2014) of this book costs over $200 on Amazon. However, the fifth edition (2011) costs less than $10. You do not need the most current edition of textbooks. Older editions have much of the same content with generally only minor updates. You will also find more free resources available on the internet with older editions. Search for lectures on YouTube using the textbook title. Each chapter is divided into several sections. Each section contains Examples (problems with solutions) and Checkpoints (problems for the student to work out). Answers to all Checkpoints are found in the back of the book. Additionally, there is an inexpensive DVD-Rom available with videos showing the solutions (more on that later). The answers for all of the odd problems in the Exercise Set are located in the back of the book. At the end of each chapter is a Chapter Summary, Review, and Test. Answers to all review questions are in the back of the book. 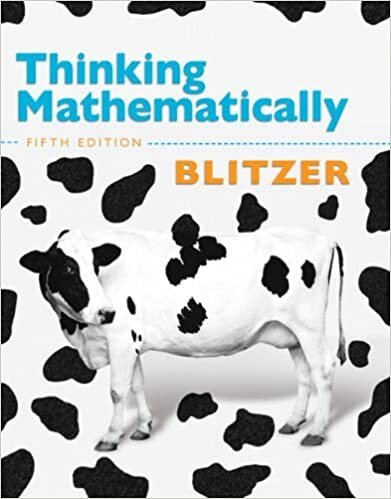 Answers and step-by-step solutions for the tests are found on the Blitzer ThinkingMathematically youtube channel. Answers abound! A cheap, used math textbook is of no value without the answers, but in this situation, answers and solutions are readily available. Answers for Checkpoints, odd-numbered problems from the Exercise Set, and Review Questions are located in the back of the book. ThinkingMathematically youtube channel has answers and step-by-step solutions to the Chapter Tests. See the example below. An inexpensive (around $6) DVD-Rom (ISBN 978-0-321-64640-8) is available that features a set of complete lectures covering every Checkpoint and answers and step-by-step solutions to the Chapter Tests. WARNING: This is an older DVD (2011) and is intended for use on Windows XP or Vista or Mac OS 10.4. Using Windows 10, I was only able to access the Checkpoint videos. I copied the ones that worked into a file on my computer for easy access because the DVD menu didn’t work. Even though I was not able to access everything on the DVD, there were still 822 Checkpoint videos which will be very helpful! Completing a college textbook might seem daunting to your high schooler. But do they need to finish the whole textbook? No! As you can see from the chart below, 4 out of the 15 chapters do not cover content in the DSST exam. You would not need to work through them. In addition, chapters 6-12 cover 75% of the exam’s content so you would want to spend the bulk of your time in those seven chapters. * Percentages indicate the approximate amount of the exam devoted to this content area. The total that I paid for the book and DVD was $18.23! When you consider the teaching resources available – answers in the textbook, YouTube videos, and DVD-Rom – this could be a very inexpensive, self-teaching resource for the DSST Math for the Liberal Arts test.